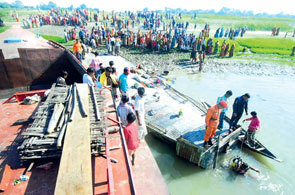 A ferry carrying 150 passengers sank after being struck by a trawler near Alipur, Bangladesh on the river Surma. The vessel was loaded with stone workers and their families. Survivors state that many passengers were asleep and the windows were shut when the vessel overturned. At least 37 reported dead with most being women and children. Reports states that the vessel was overcrowded and visibility was poor.